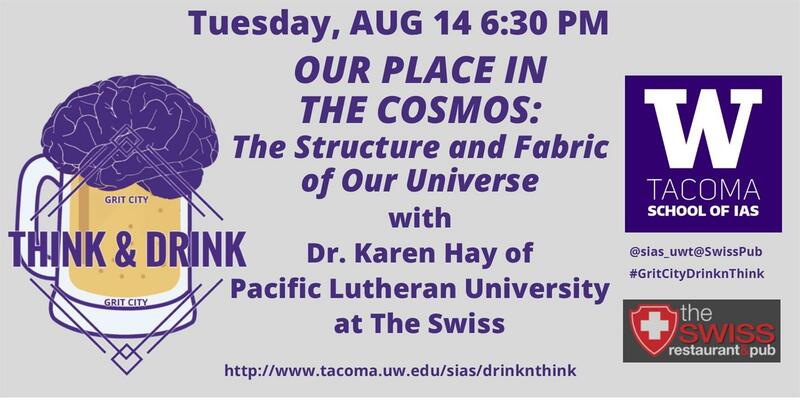 Tuesday, Aug. 14, 2018, 6:30 – 8:30 p.m.
Our Place in the Cosmos: The Structure and Fabric of Our Universe with Dr. Katrina Hay, Pacific Lutheran University. Cosmology reveals elegant structure, even at unfathomably large scales. Physics tells the story of surprising simplicity in the laws of nature and a mysterious link between space and time. Come hear PLU faculty member Dr. Katrina Hay talk about the cosmos. Katrina (Katie) Hay is an Associate Professor of Physics at Pacific Lutheran University. After studying physics and math at Linfield College in Oregon, she focused her Physics Ph.D. work on fluid dynamics at Oregon State University. At NASA’s Jet Propulsion Laboratory in 2005, Katie helped design the timeline for the Dawn Mission to the asteroid belt. Her passions for astronomy and energy have led to outreach projects, including writing and illustrating the children’s book, “Little Bear’s Big Night Sky.” Katie mentors undergraduates in observational astronomy research.